The time has finally come for the Apple Watch. Apple CEO Tim Cook unveiled the wearable -- the company's first entirely new product line in five years -- Monday at the Yerba Buena Center for the Arts Theater in San Francisco. After talking about a number of other updates, Cook called Apple Watch "the most personal device we have ever created" and "the most advanced timepiece ever created." And it will be by far the most expensive smartwatch ever created -- at least for the 18-karat solid gold version, which will be priced from $10,000 up to $17,000 depending on the size, color and band options. The basic version starts at $349 for the Sport, and between $549 and $1,049 for the midrange stainless steel model, depending on size and choice of watchband. Preorders for Apple Watch begin April 10 and they will ship starting April 24. Calling the new device a comprehensive health and fitness companion, Cook gave a brief summary of the health and fitness capabilities of Apple Watch, like tracking your movement throughout the day, giving you weekly reports and targets for next week, and reminding you when you've been sitting to long and ought to get up and move around. A video featuring model and women's health advocate Christy Turlington Burns showed her talking about how Apple Watch fitness apps help her train for races like an upcoming marathon. Developers have been creating thousands of new apps for the wearable, which is designed for quick bursts of use -- just a few seconds at a time. Cook ran through some of the various ways Apple Watch can connect to social media, such as the Facebook app, and described how it can be used to keep track of news right when it happens. VP of Technology Kevin Lynch, who has been overseeing the software on Apple Watch, demonstrated how you can press the crown to start Siri and get readouts on the watch face. He also showed how to pay with Apple Pay on the watch, to a round of applause. He answered a phone call from Bow Wow Meow on the watch on stage and ordered himself an Uber. Showing off how the watch can be used while traveling, Lynch illustrated how Passbook can get get you through airport security, and let you skip check in at a W Hotel, so you can go straight to your door and unlock it with your wrist. He also used an app from alarm.com to unlock the garage door at his home. Cook came back out on stage to explain the Apple Watch's app store section where you can see, browse and download apps, view how to videos, and learn about the watch even before you get one. Apple Watch will work in tandem with iPhone 5, 5C, 6 and 6 Plus running iOS 8.2, a software update which is available for download Monday. Apple Watch communicates with Wi-Fi as well as Bluetooth so when your phone is out of Bluetooth range you can still get calls and notifications on the watch. Perhaps allaying concerns about the device's lifespan, Cook avowed that it would have "all day battery life across a range of activities. During a typical day you can expect 18 hours and at the end off the day there is a simple and elegant way to charge it that only Apple would come up with," he said. A magnetic charger clicks into place on the back. The aluminum Sport model will come in silver or space gray with colorful plasticized bands. Of course, Cook said, it's "not your usual run of the mill aluminum." The three "collections" are all based on the same curved-edge rectangular-screen design. The face will come in two sizes -- 42mm and 38mm. As previously reported, the Sport will start at $349 for the 38 mm face. It will cost $50 more for 42 mm model. The midrange collection (which the company refers to as simply "Apple Watch") will have the widest variety of bands -- three leather bands, sport bands, a linked bracelet and a metal mesh Milanese loop. It will have a stainless steel case (special stainless steel, naturally) with a traditional finish or in space black. The stainless model will run from $549 to $1,049 for the smaller size, depending on the selection of watch band. Again, it will be $50 more for 42 mm size. 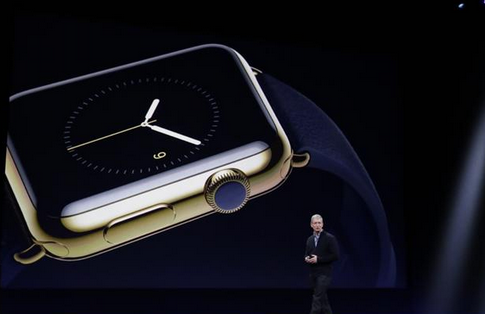 Apple Watch Edition is, Cook said, "unbelievably unique and very special." The cases are made from 18-karat solid yellow or rose gold and they come with "beautiful custom designed bands with details like elegant clasps and buckles also made of solid gold." They will be sold in "limited quantities" at select stores and will be priced from $10,000 to $17,000. Before unveiling the wearable, Cook made fans wait just a little longer as he took the stage and opened the event with a video of Apple's new store in China. "We've got a few more reasons for you to visit those stores today. And I'm going to start with Apple TV," he said. He invited HBO CEO Richard Plepler to introduce HBO Now, the cable network's streaming service, which will launch exclusively with Apple TV. Cook announced that the company is lowering the price of Apple TV to $69, from $99. He also highlighted the success thus far of the mobile payment system Apple Pay, which he said has seen the number of locations accepting it triple in the three months since its launch. Cook touted the fact that Coca Cola plans to have 100,000 vending machines that take Apple Pay by the end of the year as a sign that the NFC payment system is "forever changing the way we pay for things." Cook brought out Jeff Williams to talk about HealthKit and the new ResearchKit for medical research. The five few apps will launch immediately for breast cancer, diabetes, cardiovascular disease, asthma and Parkinson's, and starting next month the whole thing will launch -- and it will be open source, so it can be used on non-Apple devices. "We challenged ourselves to reinvent the notebook -- and we did it," said Cook. The new model -- powered by the 1.1 GHzIntel Core M -- weighs just two pounds. It's the lightest Mac ever, and the thinnest, 24 percent thinner than the MacBook Air. Apple's head of marketing Phil Schiller said this makes "a huge difference." It has a full sized keyboard that goes all the way to the edge of the all-metal body. Besides being larger, the keyboard is also thinner with larger, more stable keys for more accurate typing. The 12-inch Retina display is "truly is the best display we've ever built onto a Mac," with 2,304 by 1,440 pixel resolution -- a total of nearly 3.3 million pixels. It will also consume 30 percent less energy. The new "Force Touch" trackpad has force sensors to move beyond just touch-to-click and full click. The trackpad will respond differently to the force of your press, for instance fast-forwarding faster the harder you press while watching a video. And fans will love this: The MacBook is now fan-less, making it much quieter. The company says it will be able to deliver all-day battery life -- enough for 9 hours of wireless web surfing, or 10 hours of iTunes movie watching -- by creating contoured batteries to fit into the new slimmer body design. The contouring allows 35 percent more battery than the typical rectangular shape. The new MacBook will begin to ship April 10. The 8GB model will start at $1299, and $1,599 for 512 GB. But the main attraction at the event was the Apple Watch. First revealed in its prototype phase alongside the iPhone 6 and iPhone 6 Plus at Apple's September media event in Cupertino, Calif., the Apple Watch is the company's highly anticipated entrance into the wearables market. Leaks and rumors have fueled months of excitement for the smartwatch. It is also Apple's first foray into a new product market since it released the iPad in 2010. Then, the company sold an impressive sold 7.5 million tablets in the first six months. Reports have said that Apple ordered an initial run of between 5 and 6 million Apple Watches. That's more than the aggregate number of smartwatches shipped in all of 2014, which according to Strategy Analytics, totaled 4.6 million. CNET reports that Strategy Analytics predicted Apple will ship 15.4 million Apple Watch units in 2015, giving the company 54.8 percent of the global smartwatch market and bumping Samsung to number two. "Apple's bet is that 5 percent of Apple users that have iPhone will buy the watches," said CBS News business analyst Jill Schlesinger. "That would translate into 15 million people buying Apple Watches, or 55 percent of the smartwatch market." Other industry analysts are less optimistic, with sales projections ranging from 8 to 10 million units in their first nine months on the market. Given that the cheapest model will start at $349, the cost might be a hurdle for some consumers. "This is a higher price point than other smartwatches," Schlesinger noted. "$300 is really what the market has; Apple is coming in at $349." Complete coverage of Apple on CNET.